After our Burren adventure we got back to home base and cleaned up. Dave Lewicki had given us a list of possible sessions and we were mulling them over. In Ennis at Cruz’s Brid O’Gorman was leading a session that Dave warned would likely be crowded. She’s a fabulous player, but none of us were in the mood for crowds or long drives. Also in Liscannon there was supposed to be a session lead by fiddler Laura Ungar whom we’d heard playing in 2012 out on the Beara Peninsula at the Allihies Michael Dwyer Festival. She played there with Martin Quinn on box and John Rhynne on flute. She’d just graduated from the Limerick School back then and showed great promise. A session with her in Liscannon would be great but again Liscannon was a good long drive from here. Since we’d been lucky at the Roadside since first finding it in 2016 and having met Christy and Terry there this trip we thought we’d go there, catch up with mail, they have WiFi, and if we didn’t hear anything we liked we’d head to Ennistimon and see what was happening. As we sat doing our mail and listening to some lovely modern music played by a French violist and a guitarist, sipping a pint, I heard the door open and spotted Paul Dooley coming in. I said hi to him, and of course he didn’t remember me, no surprise there. We’d met him at a session in 2016 at Cooley’s in Ennistimon. He’s a great player and seemed like a nice man, but we didn’t get to know him then. Seeing him walk in though promised something interesting so we stuck around. After about 15 min. James and I heard Paul playing with a flute player. I got up and moved toward the area where it was being played and saw Morgan standing at the end of the bar with a smile on his face. The music sounded great. They played a couple of sets and Morgan and I walked over to them. Morgan introduced us and said “would you mind a few Yanks joining you if we promise to play only what we know and not feck up the rest!” Paul laughed and said “get in here.” We got our instruments out of the car and made our way in, sat down and tuned up. I reminded Paul that we’d met him 2 years previously at the session that he and Adam were leading at Cooley’s in Ennistimon. Paul introduced us to Seamus Hynes on flute. I recognized Seamus but couldn’t recall where we’d met before. Paul began to remember our previous meeting and it felt like a connection was forming, when we started playing tunes with them it all fell into place. There’s times you get lucky and meet the right players and this was one of those occasions. Paul and Seamus are both brilliant players who were happy to share the space. They kept asking us to start tunes, for as Paul said, “we play the same shite all the time, it’s good to hear something new.” We kept saying we wanted to hear things we didn’t know, so a good balance was struck between things all of us knew and didn’t know. It’s always great ear training to have to catch something new on the fly, so rather than being intimidated you go with the flow. Paul said that it’s nice to have a little uncertainty in the tunes, so it’s not formulaic. There were tourists coming and going and a few who stuck around to listen. One couple from Los Angeles sat listening through the first 2 hours and were really into it. Billy Archibald the publican came over and told Morgan that there were three pints of stout on the bar for us and the gentleman from L.A. had gotten them for us out of appreciation. We turned to their table and thanked him and his wife. 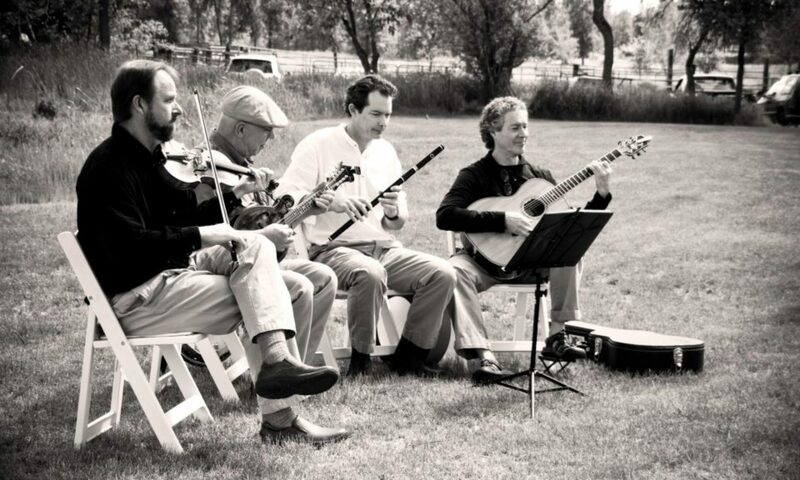 They told us how much they enjoyed hearing traditional Irish music. James told them we were tourists as well, but they said we played so well with Paul and Seamus that they hadn’t noticed, that it didn’t matter, it was a pleasure for them to be there. Another couple from Idaho were taking tons of photos and couldn’t believe we were from Spokane, WA. Paul and Morgan were talking fiddles and bows and swapped instruments and bows to try out. Paul liked Morgan’s bow (one Morgan made). Seamus who is a true lefty plays flute left handed and was telling us he has two brothers who are actually right handed play left handed because their father who is left handed like Seamus taught them. 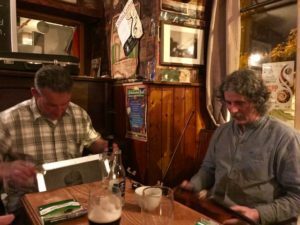 After we wound things up around midnight we chatted and it turns out that Paul makes harps, actual copies of early Irish wire strung harps, Morgan had told him I did lutherie work as well and that he was a bow maker. That opened a whole other door for connection since we spoke one another’s craft language as well. I told Paul I’d read that the sound boxes of the early harps were carved from Willow. He nodded yes and that he’d done so and that it was very uncooperative wood to carve, stringy and tough with interlocking grain but that it sounded glorious, like nothing else. That led to tool talk, this is how things go when luthier’s get together. Shop talk! Billy wanted to close up so we had to say goodnight to them both, I gave Paul one of my business cards and told him if he ever considered visiting he was a welcome guest. The five of us were happy for the meeting, Seamus in a very understated way said that it was a great evening. A night like that is why we come to Ireland, to connect and share our joy of the music. After we got back to our house in Fanore we were all wound up and high from the playing. It took us over an hour to come down and get tired enough to go to bed. So ended another great day.